Examples of vaporization systems are the wick-type odorizers and bypass-type odorizers. Both these systems are simple to use. However, they are only suitable for low flow and consistent flow applications. Whereas, the injection-style odorizers directly introduce the odorant into the gas stream and may be used in a wide range of flow rates. The wick-style odorizer is one of the oldest types of odorization equipment. It is straightforward, inexpensive and easy to use. It is perhaps the only way to odorize a single customer and is known as the “farm tap” odorizer. They are usually small, and the odorant is contained in a small bottle and installed on the service line near the gas meter. A cotton wick is inserted into the odorant and is saturated. The opposite end of the wick extends into the gas stream. The odorant draws up the wick and evaporates into the gas. Setting the dosage on this style of odorizer is performed by varying the wick size. The wick-type odorizer is only effective for odorizing individual lines such as a farm tap. The odorant usually recommended for wick odorizers is thiophane which smells different than mercaptan. For this reason, at times when the town uses mercaptan in their distribution system, a diluted mercaptan may be utilized. The drawbacks of wick-type odorizer are that the gas can be over-odorized during the summer when gas flow is low, alternatively, in high-flow applications, the gas can be under-odorized and not detectable. This system has no flow tracking ability like the injection systems, and it is hard to monitor periodically. Wick odorizers are also susceptible to liquid contamination, and other particulate contaminants can prevent the wick from drawing up the odorant and evaporating. The bypass odorizer is also a simple and inexpensive method for a small system and is still used today. In this process, a portion of a gas stream is diverted to a tank that contains liquid odorant. Most of these systems even include wicks to increase vaporization. The amount of gas diverted is dependent on the flow in the pipeline. The diverted gas flows on top of the odorant and leaves the tank, saturated, returning to the gas pipeline, thus odorizing it. While these systems are easy to fill, easy to install and replace, they also have significant disadvantages. When flow widely varies the odorizer will not track flow, therefore, the odorization is not accurate. Liquid contamination also hinders the evaporative process. If water is a contaminant, even at 0.5% (by volume), and temperatures fall below freezing, the odorizer will stop working. These odorizers also need to have their sight glass checked every month. While it is easy to refill the tank with the odorant, each time it is performed a significant amount of odorized gas is released to the atmosphere. As injection-type odorizers are designed more cost effectively to service smaller systems, the bypass odorizer will become obsolete. One manufacturer created a design similar to the wick-odorizer with two pitot tubes instead of the wick. This model performed well in the summer months, though failed in temperatures below freezing. 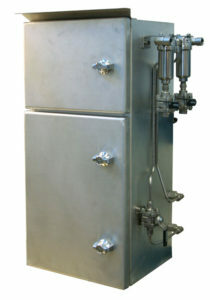 The bypass odorizer was modified to permit tracking the natural gas flow. In this case, the higher pressure gas from a transmission line is used to introduce odorant vapors into a lower pressure distribution line. By diverting non-odorized natural gas through an odorant tank, the saturated gas is returned to a downstream distribution line. This style is suitable for lower volume applications and while it is more expensive than the traditional bypass it offers cost incentives versus feature-rich injection systems. In our next post, we share information on chemical odorant injection odorization.